Playing in the Tim Horton's Brier on the National stage is nothing new for Steve Laycock. 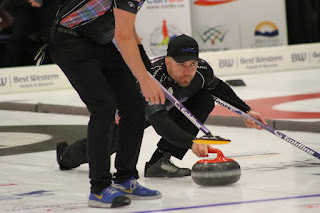 The Saltcoats-born curler and graduate of Yorkton Regional High School will be making his 8th appearance at the event but for the first time, he will be doing so not representing Saskatchewan. 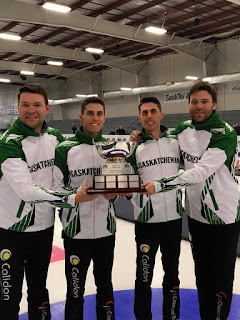 This time he will be represented British Columbia during the 2019 Tim Horton's Brier in Brandon that kicks off this weekend, playing third for Jim Cotter's rink who captured the BC Men's title earlier this month. Laycock joined the BC rink after most teams across the country shuffled their teams after the 4-year Olympic cycle ended last summer and he admits it'll be probably will hit him little more this weekend that he'll be representing a different province. "It hasn't been all the different throughout the year, but I think when I go to put on that BC jacket for the first time, that's when it will hit me & will feel a little different but either way I'm excited for the opportunity to play at the event once again, no matter the province." Laycock skipped the Saskatchewan rink to a 6-5 record at last year's Brier in Regina, and with this years edition not too far away just across the border from his hometown of Saltcoats either in Brandon, he says expects to receive lots of support. "I have a lot of family and friends that will be coming to watch, and hopefully there will be people there I didn't expect to come that will make the trip because it's so close by and hopefully they don't have trouble of throwing the odd cheer out for Team BC here and there." Laycock and Team BC will open up their Brier on Saturday night at 7PM when they face Stuart Thompson and Team Nova Scotia. The event which runs from March 1st to 9th will officially kick off on Friday with the Wildcard game featuring Brendan Bottcher up against John Epping. 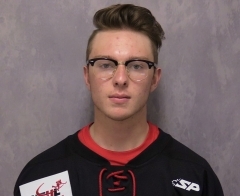 Dawson McKenzie scored the OT winner just 66 seconds into the extra period to lead the Weyburn Red Wings to 4-3 victory over the Melville Millionaires on Wednesday night. Damian Bentz led the Mils with 1G 2A while Mac McPeak and Josh Borynec chipped in with singles for the Moneymen who've now dropped their last 10 games. Both teams have 3 games remaining as they battle for that playoff spot. The Red Wings will play the Estevan Bruins twice this weekend before taking on Yorkton on Tuesday. 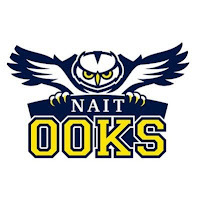 Meanwhile the Mils will have a home and home this weekend with the Yorkton Terriers before visiting the Nipawin Hawks on Tuesday. GX94 will broadcast Friday night's Highway 10 battle in Yorkton, with Yorkton Dodge Junior Hockey, "Sask Milk" pregame begins at 7:20 with the PXP kicking off at 7:30 from the Farrell Agencies Arena. 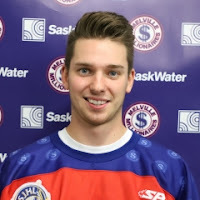 It's been a special rookie season for Melville Millionaires' F Luke Spadafora and today (Wed) he was recognized for his efforts when the Saskatchewan Junior Hockey League announced their major award winners. 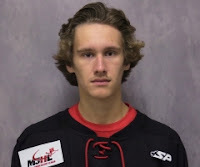 The 18 year old Calgary, AB product was named the SJHL's Rookie of the Year beating out Notre Dame's Nolan Renwick & Vincent Nardone of the Flin Flon Bombers. "I've very happy for him, he deserves it as ever since we acquired him he's been a huge part of our offence, he scores goals, he sets up goals and does everything on both sides of the ice", Mils Head Coach/GM Kyle Adams said. Spadafora, who was acquired by the Mils from the Humboldt Broncos earlier in the season has compiled 16 goals, 26 assists for 42 points in 52 games combined between the Mils and Broncos. Other SJHL award winners: Melfort's Carson Albrecht (Player of the Year), Justin Ball of the Melfort Mustangs (MVP), Battlefords' Cody Spagrud (Top Defenceman, Kindersley Klippers G Justen Close was named SJHL Goalie of the Year and Klippers HC/GM Clayton Jardine crowned as SJHL Coach of the Year. 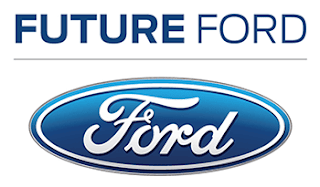 In this weeks edition of the "Future Ford" Melville Millionaires Coaches Show, Head Coach/GM Kyle Adams discusses this past weekend's game vs. La Ronge & Weyburn and preview's tonight's crucial showdown with the Red Wings. The Swan Valley Stampeders snapped their 3 game losing streak on Tuesday defeating the Neepawa Natives in Swan River, 7-3. Brian Harris (2G 1A) and Brad Goethals (3A) led Swan with 3 points each while Matt Osadick also chipped in with 2 assists. MJHL MVP Josh Tripp, Troy Quinn, Jaden Townsend, Campbell Balk and Josh Maucieri chipped in with singles. 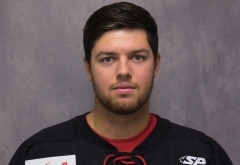 Stamps' netminder Merek Pipes made 25 saves on 28 shots to earn his 20th victory over the season. With the win, the Stampeders' clinched the 2nd seed heading into the MJHL playoffs and they'll play their second to last regular season on Friday night when they visit the Neepawa Natives. The Winnipeg Blues extended their winning streak to 9 games after a 5-2 victory over the Wayway to snap the Wolverines 3 game winning streak. Jack Kennedy and Karstin McDonald scored for the Wolverines while Nathan Reay made 29 saves on 33 shots in the loss. The Wolverines still sit 8th overall in the MJHL standings, and they'll return to action on Friday night when they visit the Selkirk Steelers. 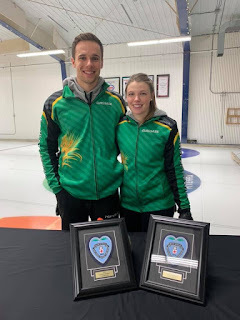 The 2019 Curl Sask Mixed Doubles Provincial Championships were held this past weekend in Weyburn and a duo of local products were crowned champions. Jill De gooijer who hails from Kelliher and Foam Lake's Garret Springer captured the Provincial title after a 10-5 victory over Brayden Stewart and Chaelynn Kitz in the Final. It was pretty impressive weekend for Yorkton United FC Soccer teams as they captured 5 medals, including 4 Golds at the 2019 S4L 6-Aside Provincial Championships in Saskatoon. Meanwhile the U15 Boys fell 4-0 to the Prince Albert Celtics. Rookie netminder Nathan Reay turned aside 41 shots for his 1st career MJHL shutout to lead the Waywayseecappo Wolverines to a 1-0 victory over the Steinbach Piston on Sunday night. Greg Lee's 12th goal of the season, 13:39 into the 1st period stood up to be the game winner for the Wolverines. Matt Radomsky made 15 saves on 16 shots in the loss for Steinbach. The Wolverines' now sit at 59 points, and sit just 1 point back of Dauphin for 7th place overall and they will return to action on Tuesday night when they host the Winnipeg Blues. The Swan Valley Stampeders and Selkirk Steelers completed their game that was delayed from October due to ice problems and it was the home team coming out on top. The Steelers handed the Stampeders their 3rd straight loss defeating them 5-4 on Sunday. Carter Barley and Noah Basarab scored two quick goals when the game resumed for the Steelers while Alex Uryga added his 14th late for the Stamps. The Yorkton Terriers had their 4 game win streak come to an end on Saturday after a 5-2 loss to the Nipawin Hawks. Aiden Bulych and Dino Antoniadis scored for the Terriers while Andrew Henderson turned aside 32 shots in the loss. Brodie Girod scored the game winner while Walker Cote had 3 assists to lead the Hawks. The Terriers' will return to action on Friday night when they host the Yorkton Terriers. GX94 will broadcast the game with Yorkton Dodge Junior Hockey, "Sask Milk" pregame begins at 7:20, pxp kicks off at 7:30 from the Farrell Agencies Arena. 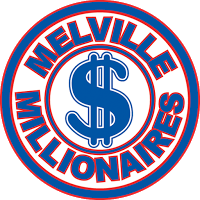 The Melville Millionaires now still sit one point up on Weyburn after falling to the Red Wings 6-4. Jordan Kazymyra led the Red Wings with 2 goals while Drew Anderson, Garrett Szeremley, Sean Olson and Ben Hiltz also replied for the visitors. Luke Spadafora, Luke Nkwama, Max McPeak and Nash Wood scored for the Mils. After winning 10 straight, the Swan Valley Stampeders have lost their last 2 including a 5-3 defeat last night to the Winnipeg Blues. Ty Naaykens and Sulivan Shortreed scored twice for the Blues while Tony Apetagon had 1G 2A. Josh Tripp, Tucker Scantlebury and Campbell Balk replied for the Stamps while Merek Pipes made 32 saves on 37 shots in the loss. The Stamps' wrap up their road trip when they'll complete their suspended game in Selkirk from October. The game will start at 3PM and will start with 9:27 remaining in the 2nd period and tied at 3-3. 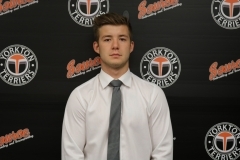 The Yorkton Terriers won their 4th straight on Friday night, defeating the Flin Flon Bombers 5-2 at the Whitney Forum. Colby Brandt notched two goals for the Terriers who got singles from Chantz Petruic, Brendan Mark and Aiden Bulych. Cody Bruchkowski also had 4 assists for the visitors. Andrew Henderson was solid between the pipes making 52 saves in the win. The Terriers wrap up their weekend road trip on Saturday night in Nipawin. The Melville Millionaires earned a big point but fell in the shootout 3-2 to the La Ronge Ice Wolves. Daunte Fortner and Zach Bannister scored for the Ice Wolves in regulation while Jake Gudjonson had the SO winner. Max McPeak had both goals for the Mils who entertain the Weyburn Red Wings on Saturday. The Wayway Wolverines book their ticket into the MJHL playoffs on Friday after a 4-2 win over the Virden Oil Capitals. Jake Bestul scored twice for the Wolverines while Anthony Bilka and Nick Doyle provided singles. Isaac Labelle made 37 of 39 saves in the win. The Wolverines return to action on Sunday hosting the Steinbach Pistons at 6PM. The Swan Valley Stampeders had their 10 game win streak snapped after a 5-3 loss to the Portage Terriers. Matt Osadick led the Stamps with 2G 1A while Alex Uryga had the other in the loss. Reece Henry chipped in with 2 goals to lead the Terriers. The Stamps will continue their road trip on Saturday visiting the Winnipeg Blues at the Bell MTS Iceplex. 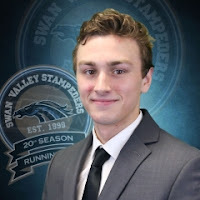 The Manitoba Junior Hockey League announced the winners of their major awards on Friday and for the Swan Valley Stampeders they had two members get rewarded for their strong seasons. D Quintin Sudom was named as the MJHL's Top Defenceman while F Josh Tripp was announced as the league's Most Valuable Player. Meanwhile for Sudom, in 50 games this season he has compiled 16 goals and 55 points which puts him 8th in league scoring and tops among MJHL defenceman. The last Stampeders to win the league's Top defenceman was Bredenbury, SK Clarke Byczynski in 2011. Other MJHL award winners included: Portage Terriers Head Coach/GM Blake Spiller (Coach of the Year), Winnipeg Blues G Jeremy Link (Top Goaltender), Virden's Ben Dalke (Hockey Ability) and Portage Terriers D Owen Murray who won the Rookie of the Year. Stamps' Forwards Josh Tripp & Brad Goethals and Dman Quintin Sudom were also named to the MJHL's First All-Star team. 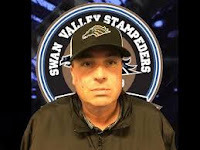 In this weeks edition of the Swan Valley Stampeders Coaches Show, Head Coach/GM Barry Wolff talks about their 10 game winning streak, their weekend road trip and the return of 18 year old D Lane Kirk back to their line-up. Dauphin Junior Curling, with the support of Dauphin Curling Club and in partnership with Dauphin Recreation Services, will open its doors to over 128 junior curlers, coaches, and fans next year. Dauphin will be hosting the 2020 Canola Growers Junior Men’s and Women’s Provincial Championships from January 1-5, 2020. Dauphin’s Lauryn Kuzyk represented Manitoba at junior nationals this past season playing third for Mackenzie Zacharias. There were 28 other junior curlers from Parkland competing at the junior provincials. Winners of the 2020 Junior Men’s and Women’s Provincial Championships will represent Manitoba at the 2020 New Holland Canadian Junior Men’s and Women’s Curling Championships in Langley, B.C. from January 18-26. Ticket information for the 2020 Junior Provincial Championships will be available in the fall of 2019. 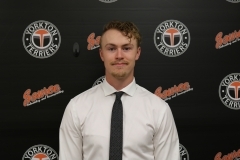 The Yorkton Terriers won their 3rd straight game in convincing fashion on Wednesday night, hammering the La Ronge Ice Wolves 9-3 at the Farrell Agencies Arena. The Terriers would be the only team to get on the board in the 1st, as the puck would squirt out for Quin Hobbs who would go out on a clear-cut breakaway and he would make no mistake going top shelf for his 11th of the season to give his team a 1-0 lead after 1 period. Mason Mullaney (pictured above) would add to the Terriers lead just 1:41 into the 2nd, as he would take a nifty feed in front from Colby Brandt and slip it through the five-hole of Jordan Frey for his 8th to make it 2-0. Then 9:32 into the middle frame, it was a partial break and would go short-side shelf for his 29th of the year to make it a 3 goal game. Mullaney and Petruic would add their second goals of the period, their 9th and 30th goals respectively to give the home team a 5-0 lead after 40 minutes. In the 3rd period, the Ice Wolves would get on the board, 2:33 in as Stewart Pond would walk out and beat Andrew Henderson over the left board for his 4th of the campaign to make it 5-1. 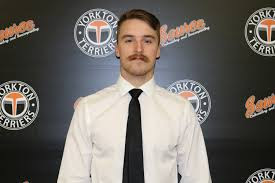 But the Terriers would respond with 3 quick goals of their own from Brendan Mark, Quin Hobbs and Mason Mullaney who completed his 1st SJHL Hat-Trick at the 10:25 mark of the 3rd period and the game sat at 8-1 Yorkton. Also later in the 3rd, Chantz Petruic would complete his Hat-Trick and net his 31st of the season while Zack Bannister and Jake Gudjonson would wrap up the scoring with a couple more for the Ice Wolves to make it a 6 goal Terrier win. Andrew Henderson turned aside 34 shots in the Terriers' goal to earn his 10th vicotry of the season while the Ice Wolves had both of their goaltenders make appearances in the game. Jordan Frey played the first two periods and was relieved after allowing 5 goals on 29 shots while Brendan Benoit in relief turned aside 9 of 13 shots. The Terriers will have the night off today (Thurs) before embarking on two-game weekend road trip this weekend, on Friday in Flin Flon before tangling with the Nipawin Hawks on Saturday night. Melfort F Justin Ball became the first SJHL player in 8 years to score 50 goals as he had one of the goals to lead the Mustangs to a 6-4 victory over the Melville Millionaires. Carson Albrecht scored twice for the Mustangs while Kayle Tosh, George King and Colin Schmidt chipped in with singles. Sam De Melo, Aidan Steinke, Luke Nkwama and Luke Spadafora replied for the Mils who got 29 saves in the loss from G Berk Berkeliev. The Mils have now lost their last 7 games, but still sit with a 2 point lead on the Weyburn Red Wings for the final playoff spot in the SJHL standings. Josh Tripp and Brad Goethals had 3 points each to lead the Swan Valley Stampeders to their 10th straight win on Wednesday slipping by the OCN Blizzard 5-3 at the Centennial Arena. Tripp had 1G 2A and Goethals had 2G 1A while Carter Cockburn & Matt Osadick chipped in with singles. 19 year old Michael Davis made 31 saves to improve his record to 16-2 on the season. The Stamps' improved their record to 39-10-3-2 on the season and sit now just 4 points back of the Portage Terriers for top spot in the MJHL standings. Swan Valley will begin a 3 games in 3 night road trip on Friday night with a visit to Stride Place to take on the Portage Terriers. The Waywayseecappo Wolverines strengthen their grip on the final playoff spot in the MJHL standings after a 6-3 victory over the Dauphin Kings. The Wolverines now sit 6 points up on Winkler for the 8th position. Greg Lee and Jake Bestul each score twice for Wayway while Preston Seymour and Conrad Phillips also scored. 20 year old Isaac Labelle turned aside 24 of the 27 shots to earn the victory in goal for the Wolverines. Eamonn Miller, Nakodan Greyeyes and former Wolverine Riley Shamray replied for the Kings. The Wolverines return to action on Friday night when they visit the Virden Oil Capitals at Tundra Oil & Gas Place. The Winkler Flyers Hockey Club has announced that they have mutually parted ways with General Manager Ken Pearson. Pearson had served as the club’s Head Coach and General Manager since the start of the 2011/2012 season before moving into the General Manager’s role exclusively this season. “We would like to thank Ken for all of his efforts over the past eight years and wish him all the best in the future,” said Flyers President Warren Dyck. The club has also announced that Jeff Jeanson will take on the General Manager role on an interim basis. “I’m looking forward to the challenge,” said Jeanson. The Swan Valley Stampeders earned their 9th straight victory on Monday night after a 3-2 shootout win over the Waywayseecappo Wolverines. Brian Harris (pictured above) would give the visitors a lead late in the 1st period as he would go fore-hand then back-end over top of Wolverines' goalie Isaac Labelle for his 13th of the season that gave the Stamps a 1-0 lead after 1 period. 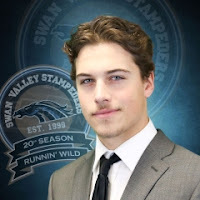 In the 2nd, the Stampeders would add to their lead with 4:54 left in the middle frame and would be Swan River's own Carter Cockburn putting home his 3rd of the year to make it a two goal game. But just under 2 minutes later the Wolverines would respond as Michael Heitkamp's point shot would get re-directed home by Bryce Krater for his 8th to make it a one goal game after 40. The Wolverines would draw even as the puck would take a big bounce off the end board and end up right on the stick of Wayway captain Jake Bestul who would then bury his 6th to make it a 2-2 game. Overtime would solve nothing and then in the shootout it would Trent Halfdanson striking first for the Wolverines, but Alex Uryga would quickly respond to tie things up before Brian Harris would get the winner in the 5th round to give the Stamps the extra point. 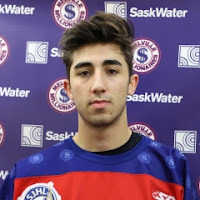 Stampeders' netminder Merek Pipes turned aside 24 of 26 shots to earn his 19th victory of the season while Top Goalie & MVP nominee Isaac Labelle made 38 stops in the shootout loss for Wayway. Meanwhile with the point, the Wolverines remain 4 points up on Winkler for the 8th and final playoff spot in the MJHL standings and they'll return to action on Wednesday as well when they host the Dauphin Kings. The Manitoba Junior Hockey League announced their nominees for their major awards for the 2018/19 season and among the selections are 3 members of the Swan Valley Stampeders. F Josh Tripp (pictured above top right) is up for Most Valuable Player, D Quintin Sudom (pictured above top left) is a nominee for the league's Top Defenceman and Head Coach/GM Barry Wolff is up for MJHL Coach of the Year. Tripp, a Swan River product is currently the MJHL's Top Scorer compiling thus far 32 goals, 44 assists for 76 points in 51 games. He also leads the league in Assists and is tied for lead in goals (32) with linemate Brad Goethals. For Wolff, in his 1st year with the Stampeders he has guided the Stamps to one of their most successful season's in franchise history, they currently sit in 2nd place in the MJHL standings with a record of 37-10-3-2, for 79 points, just 4 points back of Portage for top spot. Waywayseecappo Wolverines goaltender Isaac Labelle was announced as a nominee for two of the major awards. The 20 year old Saskatoon product was announced as one of the finalists for the MJHL's Top Goaltender and Most Valuable Player awards. Labelle in 45 games this season has a record of 21-20-0 with a 2.53 GAA and a 0.918 SV%. He also has recorded 3 shutouts. The Yorkton Terriers completed the weekend sweep of the Highway 10 battle on Saturday, with a 4-3 OT victory over the Melville Millionaires. Branden Klatt added his 2nd of the game just 17 seconds into overtime to give the Terriers their 2nd straight victory. Mason Mullaney and Ben Solomon also scored for Yorkton while Ryan Ouellette made 19 saves to earn the victory in goal. Tristan Shewchuk, Josh Borynec and Sam Mudd (1st SJHL goal) replied for the Mils while Colby Entz turned aside 36 shots in the overtime loss. The Terriers return to action on Wednesday night when they host the La Ronge Ice Wolves. GX94 will broadcast the game with Yorkton Dodge Junior Hockey, "Sask Milk" Pregame begins at 7:20, PXP starts at 7:30. Meanwhile the Mils' next game will also be on Wednesday night when they host the Melfort Mustangs. 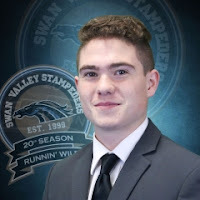 The Swan Valley Stampeders won their 8th straight on Saturday night, doubling up the Waywayseecappo Wolverines 6-3 in Swan River. Matt Osadick, Brad Goethals, and Campebell Balk each score twice while Merek Pipes made 22 saves in goal to earn the victory. With the win, the Stamps pulled within 4 points of Portage for top spot in the MJHL standings while the Wolverines had their 5 game win streak come to an end but still sit 4 points clear of Winkler for the 8th and final playoff spot. The two teams will play again on Monday night from Waywayseecappo. GX94 will broadcast the game with Yorkton Dodge Junior Hockey, there will be no pregame show and the PXP will then kick off at 6PM from the Wayway Arena Complex. 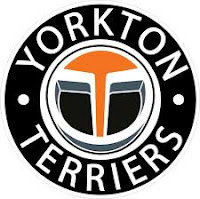 The Yorkton Terriers snapped a two game losing streak in a big way on Friday night defeating the Melville Millionaires 11-4 on the road. The line of Chantz Petruic (2G 1A), Colby Brandt (2G 2A) and Cody Bruchkowski (2G 3A) combined for 12 points to lead the way while Branden Klatt, Aiden Bulych, Greg Mulhall, Cole Keenleyside and Dino Antoniadis also scored for the Terriers. Luke Nkwama had 2 goal for Melville in the loss while Luke Spadafora and Sam De Melo chipped in with singles. 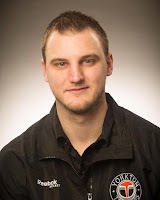 Ryan Ouellette stopped 30 shots to earn his 15th win of the season while Colby Entz (4 goals on 17 shots) and Berk Berkeliev (20 saves on 27 shots) both saw time between the pipes for the Mils. The two teams will play the back end of the weekend home and home series on Saturday night at 7:30 from the FAA. 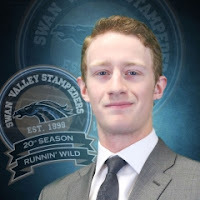 Brad Goethals had 1G 3A while Merek Pipes made 40 saves to lead the Swan Valley Stampeders to their 7th straight win defeating the Portage Terriers 4-2 on home ice. Matt Osadick, Campbell Balk and Jaden Townsend chipped in with singles. Joey Moffatt and Ty Barnstable replied with singles for Portage. The Stamps with two games in hand now sit 6 points back of the Terriers for top spot in the MJHL standings and they will return to action on Saturday night when they entertain the Waywayseecappo Wolverines at 7:30 from the Centennial Arena. Isaac Labelle made 37 saves for his 3rd shutout of the season as the Wayway Wolverines blanked the OCN Blizzard 4-0 on the road. Kylar Fenton, Jack Fenton, Dylan Soosay and Karsten McDonald scored for the Wolverines while Jake Bestul chipped in with 3 assists in the win. With two games in hand, the Wolverines now have a 4 point edge on Winkler for the 8th and final playoff spot in the MJHL standings. The Saskatchewan Junior Hockey League has announced their Divisional nominees for their yearly awards with a couple of Melville Millionaires' being named. For the 3rd year in a row, netminder Colby Entz (pictured above right) was named as the Viterra division's top goalie while Mils F Luke Spadafora (pictured above left) was named as the Viterra division nominee for the SJHL's Rookie of the Year. In 34 games so far this season, the Churchbridge product has a record of 11-16-3-2 on the season with a 3.27GAA & a 0.901 SV%. Meanwhile for Spadafora, a Calgary AB product who was acquired earlier in the season from the Humboldt Broncos, has 13 goals 25 assists for 38 points in 47 games this season. 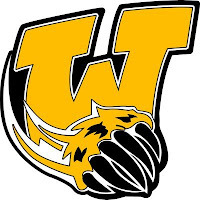 Isaac Labelle turned aside 40 shots to lead the Wayway Wolverines to their 4th straight victory on Tuesday night, 3-1 over the Winkler Flyers. Jaymes Knee, Preston Seymour and Brandon Lawson all scored for the Wolverines who now pull 2 points ahead of the Flyers into sole possession of the 8th and final playoff spot in the MJHL standings. The foursome that also includes Kevin Marsh, Dan Marsh and Dallan Muyres defeated Matt Dunstone of Regina 6-5 in the Championship Final on Sunday in Whitewood. Muyres had to make a draw to the four-foot with his final rock to help his team earn the berth. 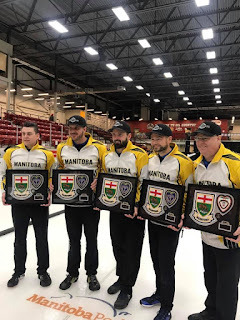 Meanwhile at the Manitoba Men's Curling Championships in Virden, Reid Carruthers' Winnipeg rink held on for a 5-3 victory over William Lyburn at Tundra Oil & Gas Place. 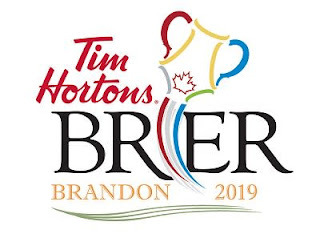 So both the Carruthers and Muyres rinks' will now represent their respective provinces at the 2019 Tim Hortons' Brier that runs March 2nd-10th in Brandon, Manitoba.